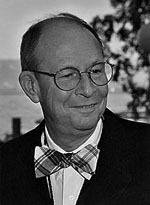 Richardson was the co-recipient, along with Douglas Osheroff and David Lee, of the 1996 Nobel Prize for physics for their discovery of super-fluidity in the isotope helium-3 (3He). He was born in 1937 in Washington DC. Richardson says that the key areas that scientists will focus on are in the biology of proteins, cells, neurobiology, medicine and especially nanotechnology. The importance of nanotechnology is in the two approaches � the precise construction of single objects by lithography, and in the production of large quantities of similar objects through chemical or biological techniques. �Nanotechnology is a term that refers to the sets of instrumentation and construction techniques used in very small objects,� says Richardson. The critical tools for nanotechnology are in such things as atomic-force microscopes, electron microscopes, multi-photon optical microscopes and high-energy X-ray facilities. To inspire and train scientists for the future requires effective collaboration and advanced research facilities where multi-disciplinary research and development (R&D) are available. Effective collaboration means to use existing strengths in disciplines, and effective discussions among young scientists and recognized leaders. This requires a willingness to share resources among the disciplines and share in educational and training activities as well as welcoming new scientific associations. �it should start with small collaboration efforts and develop excellence in a few areas. Then use growing reputations to develop other key specialities and expand the range of fields in the collaboration. The last is very important �- that is to communicate with the public,� said Richardson. Giving Cornell University as example, he said there are many research facilities there including the Cornell Nanoscale Facility, the Nanobiotechnology Centre and the Kavli Institute at Cornell for Nanoscale Science, which was founded in 2004. Apart from related nanotechnology facility centres, there is also a Laboratory for Elementary Particles Physics, the Cornell High Energy Synchrotron Source for Materials Research. �All of them are collaborations across multidisciplinary R&D activities,� says Richardson. Thaweesak Koanantakool, director of the National Electronics and Computer Technology Centre (Nectec), said that in the case of Thailand, four national centres at Science Park have started collaborative work in multidisciplinary research and development, such as the Bio-Sensor Project. The four centres are Nectec, the National Metal and Materials Technology Centre (Mtec), the Nation Centre for Genetic Engineering and Biotechnology (Biotec) and the Nanotechnology Centre. Also, the government is working to roll out incentives for private-sector interests who donate to pure scientific R&D centres or institutes recognized by Revenue Department to encourage greater development in the field. �It means if a company donates Bt100,000 for R&D it can claim it as a cost value of Bt200,000 for reduced tax at end of the year. It is still under consideration by Revenue Department and is expected to be announced in the future,� said Thaweesak.